JNN 15 Oct 2014: Six Senior figures in the Pakistani Taliban have pledged allegiance to the Islamic State and its leader Abu Bakr al-Baghdadi in a symbol of the terrorists’ expanding influence among Islamist groups. 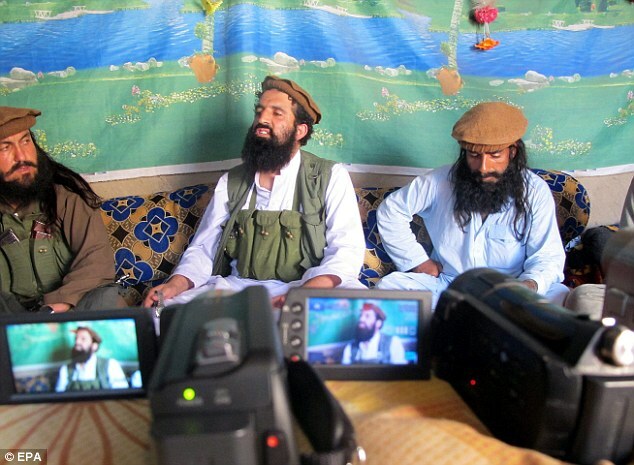 Withdrawing their loyalty to the Afghan Taliban’s leader Mohammad Omar, the men – made up of the group’s chief spokesman Shahidullah Shahid and five regional commanders – said they will remain members of the Pakistani Taliban, but added they now consider themselves affiliates of ISIS. The move is likely to have serious consequences for security in Pakistan, particularly near the Afghan border where all six of the men are based, leaving it open to the kind of violence and brutal oppression ISIS has employed in the vast swathes of Syria and Iraq under the group’s control. The official announcement of the six men’s declaration of allegiance to ISIS came in the form of an audio recording that emerged yesterday. However rumours had been circulating for weeks that several senior figures in the Pakistani Taliban were set to declare their loyalty to al-Baghdadi. ‘I show allegiance to the commander of faithful, Caliph Abu Bakr al-Baghdadi Qureshi al Hussaini, and will listen and obey every order of you and will follow your orders regardless of what circumstances may be,’ Shahid said in the recording. There is now concern that other senior figures in the Pakistani Taliban may defect to ISIS, including the group’s overall leader Maulana Fazlullah, who has previously voiced support for the terror group. Despite several members having declared their ISIS sympathies, yesterday’s announcement is the first time any senior figure within the Pakistani Taliban has actually sworn allegiance to al-Baghdadi. It also points to the Pakistani Taliban’s growing detachment from Mohammed Omar’s central command in Afghanistan, as greater numbers of Muslim extremists abandon links with Al Qaeda to flock to the so-called ‘caliphate’ established by al-Baghdadi in northern Syrian and western Iraq. The Islamic State was previously – like the Taliban – an affiliate of Al Qaeda, but terror leader Ayman al-Zawahiri admonished al-Baghdadi’s group as too extreme and expelled the group late last year. Since then ISIS has gained vast swathes of territory in the Middle East, welcomed thousands of fanatics from around the world into its ranks, and become the richest terror group in history, thanks to donations from wealthy Wahabi sympathisers and an income of up to £2million a day from oil fields. Pakistani Taliban spokesman Shahid has not been available for comment since the ISIS allegiance recording emerged yesterday, but the Washington Post has spoke anonymously with one of his close aides. ‘These commanders will remain with the organization, but will also represent ISIS in Pakistan, he said. ‘The decision came after differences developed with the Afghan Taliban. I can’t say now what are the differences, but these commanders have changed their loyalties from Mullah Omar to ISIS chief Baghdadi,’ he added. Rumours that senior members of the Pakistani Taliban were likely to pledge allegiance to ISIS have circulated for weeks, and intensified last week when the group’s leader Maulana Fazlullah voiced his support for the IS terrorists. However the Pakistani Taliban’s later issued a clarification of his words, insisting that for now the group were not abandoning historical ties with Mohammed Omar’s Afghanistan branch. Following yesterday’s announcement – where the group’s official spokesperson and regional leaders in tribal areas close to the Afghan border, including Orakzai, Kurram, Khyber and Peshawar – pledged loyalty to al-Baghdadi, those links now appear weaker than ever. There have been signs that ISIS could gain a foothold in Pakistan for quite some time, despite the country already being home to more than two dozen terrorist groups. Last month, a 12-page pamphlet was distributed in Peshawar, inviting people to join the group. Many Pakistanis have already traveled to Syria to fight with the Islamic State. Malaysian police have detained another 13 Muslim men suspected to be linked to the Islamic State. Head of the national police counter-terrorism unit Ayob Khan Mydin Pitchay says the men were detained yesterday in central Selangor state. He says further details will be released later today. Police last month picked up three Muslim men at the airport on suspicion of heading to Syria to join the Islamic State. Earlier this year, authorities detained 19 suspected militants for allegedly planning to carry out terrorist acts in the country and abroad. Seven have been charged so far and the rest released. Prime Minister Najib Razak has said the arrests show the government is serious in routing out militants. This entry was posted in Asia Pacific, Middle East, Pakistan News and tagged ISIL, ISIS, Islamic State, Pakistani Taliban, Tehrik e Taliban Pakistan, TTP. Bookmark the permalink.